It’s Tweet Tasting time again, through Steve Rush (@TheWhiskyWire), and Glen Moray (@GlenMorayDist), who are hosting their inaugural tweet tasting. #GlenMoray. 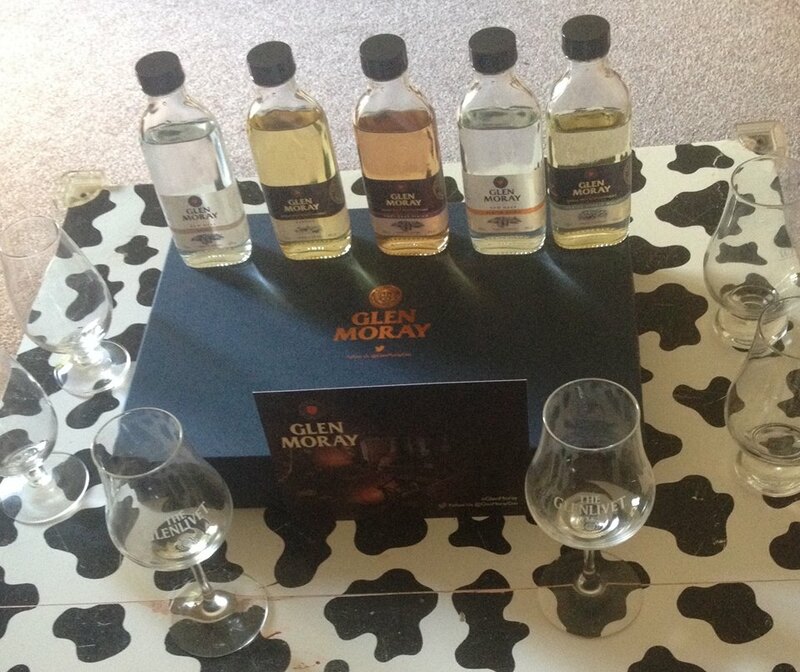 All tweet tastings are exciting but with this being Glen Moray’s first foray into tweet tastings it’s particularly exciting. I tweeted for the Corner and as it had been far too long, Stewart (@stewartcraigon) also joined in and tweeted as himself. Glen Moray have provided us with, New Make, Glen Moray Classic, Glen Moray Port Cask Whisky, Peated New Make and Glen Moray Peated whisky, so it promises to be a great night. Grassy, malted barley notes with buttery digestive overload. There are green apples, and plenty of resin notes bringing through some pear drops. Honey combines with hops, guava and sweet fudge and creamy undertones, like caramac. There is a dash of kiwi fruit too, before oats, milk and honeycomb take over. Banana bread and malted milk biscuits, before fruits come through with apples, kiwi’s and pineapples. There is a touch of redcurrants and sour rhubarb and peppercorns and a generous portion of vanilla cream. Short finish that almost evaporates, sweet fudge notes and a touch of green apples. Juicy fruit anyone? Pineapples, apples, pear, strawberries & Kiwis. Desert notes of fudge sundaes, cinder toffee, chocolate hob nobs just baked banana muffins, fighting fresh pear notes, with orange juice and a touch of lemon zest. Buttery rhubarb Crumble with vanilla ice cream. Getting the grassy notes from the NM but warmer, grass turned to hay, and damp heather and ferns. A fresh vegetal smell of a summer greenhouse. Homemade rice pudding, stewed apple, nutmeg & buttery filo pastry with crunchy sugar top. Overripe pears, lemon peel oak making itself known, slightly drying and woody. There’s still a damp moss note and a touch of earth. A burst of lemon cuts through the drying notes and gives this a last minute lift. Some spiciness appears from cracked black peppercorns and a sweet, dusty note of dried tea leaves. Short but pleasant, with creamy sweet notes and a touch of oak. The baking spices continue bringing a sweet warmth, although this is slightly short lived. A 2014 addition to Glen Moray’s selection of Speyside single malt Scotch whiskies, their Classic Port Cask Finish is treated to an 8 month finishing period in Tawny Port casks before being bottled. Robinson’s summer fruit cordial, lots of strawberry jam with fresh cream and Scones. Buttered drop pancakes with limes, cranberry and rhubarb coming through. Before if becomes too tart this is softened with vanilla pods, ripe cherry and wild brambles. Red apple skin, oranges and cloves reminiscent of a hot toffee, followed with sticky royal icing. Jam notes pulled through from the palate, there are raisins, prunes and Christmas cake spices and good quality dark chocolate. A gentle chili tingle and warming cinnamon combine with juicy plums, grape juice and lemons. There is only a nod to the barley here with just a hint of biscotti. Short, with jammy flavours sticking around the longest. It’s sweet and spicy and very delicate. Glen Moray run peated malt for 1 month of the year usually around Jan/Feb. Loving the peat puffing away, toffee apples on bonfire night, baked potato sweetness, Horlicks malt notes, pears smoked bacon, damp earth and plenty of oak notes. There’s a hint of marmite in there with coffee grinds and compost. Combining with the smell of spent sparklers, bonfire embers, and cola cooked smoked gammon. A smoke rush through the NM, first up same NM as the unpeated, but then the peat takes over, bringing BBQ smoked pineapples, plums, sticky undiluted Ribena. Red chilies charred on the stove and peat smoke. I love the pork scratching notes with salt, basil and green apple trying to push through. The fruits fade and it’s all about bonfire embers, chili foccia and a dry earthiness. The peat on this one is the star of the show, although evaporation is quick, the smoke lingers on and on. Peated Classic is a unique whisky which offers a twist on the traditional Glen Moray flavour and character. The peat is softer, flint, smoke, overpowering the fruit somewhat, the apples are there but be prepared to work for them. Oranges and a touch of sea salted caramel bring out the sweetness, before the earthiness combines with damp autumn leaves, wet sheds, damp wool making this drying and slightly oaky. Again rather short lived, which unfortunately seems to be a running theme, however there is a small amount of the peat that remains with gentle orange and milk chocolate. The peated new make was the absolute star of the show, I think the majority of the tasters wished this was readily available on the shelf. The whole range is perfectly pleasant and a good value introduction to whisky. This may appeal more to people that are starting to experiment with whisky, or if you feel like a whisky that you don’t need to think too much about. The whole range could benefit from a rise in the ABV, I think this would make a big difference to the overall product and certainly to the finish. Well worth picking up a bottle of the Classic as it’s a great price and is easy to drink. Cereal, slight orange peel note, banana, pear drops. Spicy, bananas again, sweet pears, not too hot considering the abv. Very fruity, blackberries, slight hint of cherry, peppercorns. Starts with lemon drop sweets before moving onto pear and oranges. Crushed biscuits and butter mixed together Cherry and Apple juice merging, not much woody notes, quite light and inviting. Peppery with hints of lemon juice, slight apple and pears, earthy though, a bit surprising. Quite light, almost too light but just works. This has a short finish but it leaves a lovely fruity feel. Very fruity, black cherry, red currants, hints of milk chocolate. Heavier than the classic with potato scone, then back to the fruits. A roaring fire starting in the glass, the wood beginning to burn, peppery baked potatoes, smoky bacon Smoked kippers, the end of a sunny day BBQ-ing, just wonderful! Big blast of heat, then berries and cherries before the peat comes in with a vengeance. Chilli chocolate, smoky bacon crisps, gorgeous smoke swirling around and filling the mouth. Heat dies down. Brilliant finish, gorgeous dram, perfect opener to a PeatHead night! Milk chocolate buttons, boiled milk, oranges, the peat smoke is very faint Smoke almost gone, quite disappointed, had high hopes after the wonderful nms. Lemons, light dusting of smoke, wet bonfire wood, very light. Not what I was expecting after the nms, this seems to have lost a lot of the peat, I’d rather have the nms. Highlight for me was the Peated New Make Spirit, absolutely loved it, please start selling it!